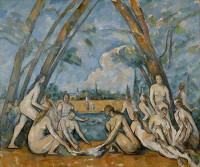 Born in Aix-en-Provence in 1839, Paul Cézanne is one of the most influential artists of the twentieth century. Technically categorized as a Post-Impressionist, Cézanne laid the groundwork for some of the most important artists involved in Fauvism and Cubism, Matisse and Picasso in particular. 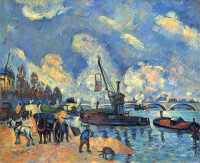 After moving to Paris in 1861, Cézanne befriended the Impressionist Camille Pissarro, and exhibited three paintings at the infamous first Impressionist exhibition in 1874. He became increasingly isolated by the late 1870s, working mostly in the French countryside and developing his mature style, which ignores the laws of classical perspective and is characterized by thick, flat brushstrokes. 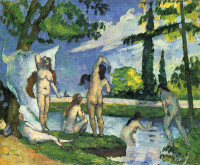 In 1895, Pissarro, Monet, and Renoir urged the art dealer Ambroise Vollard to show some of Cézanne’s paintings, and the public began to take interest in his work. He exhibited at the Salon des Indépendants in Paris in 1899, 1901, and 1902 and was given an entire room at the 1904 Salon d’Automne. Cézanne fell ill and passed away on October 22, 1906, and his artistic achievements were celebrated at the Salon d’Automne of 1907 with a large retrospective.